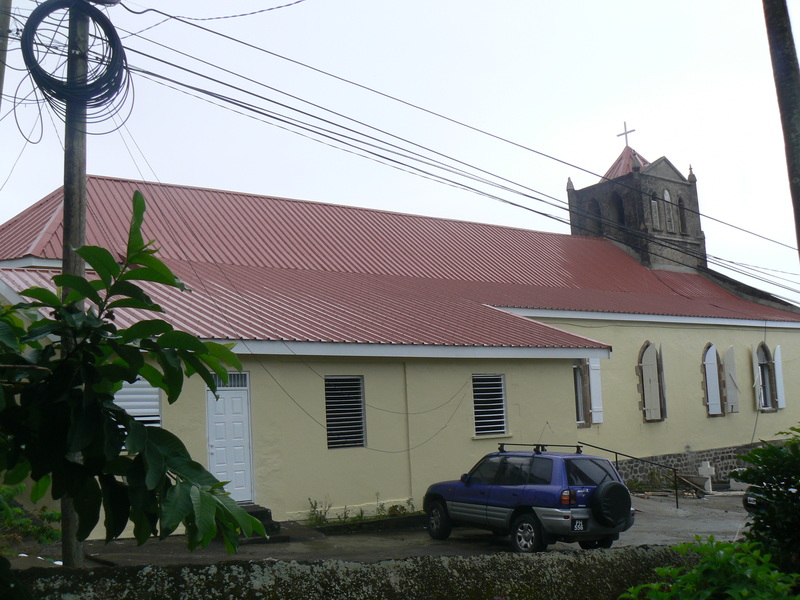 The renovation works at the National Shrine in Pointe Michel are now completed and the parishioners moved back to their on September 2014, after 7 months of worshipping in the community centre. The renovation was initiated by Monsignor Reginald Lafleur in 2009 with the upgrading of the sanctuary and the enhancing of the shrine of Our Lady. I was proud to be involved in the conception, planning and execution of this project which was completed in 2010. Additional Red Cedar panelling was done in 2012. 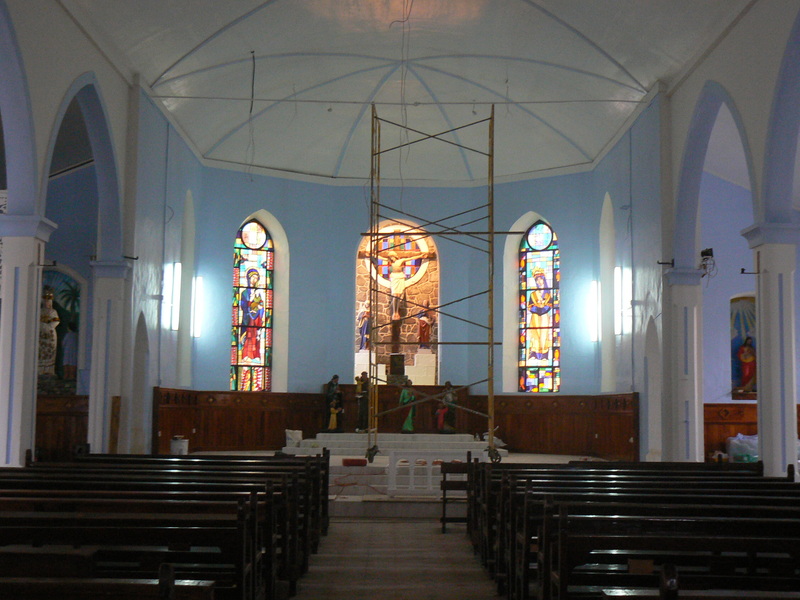 The roof and ceiling renovation works were started this January by present Parish Priest Fr. Peter Wamutitu . The St. Luke’s church in Pointe Michel was declared The National Shrine, dedicated to our Lady of La Salette, by Bishop Arnold Boghaert in 1983. A National Shrine should be a worthy and exemplary space of worship and a centre of devotion and prayer of genuine religious intensity. 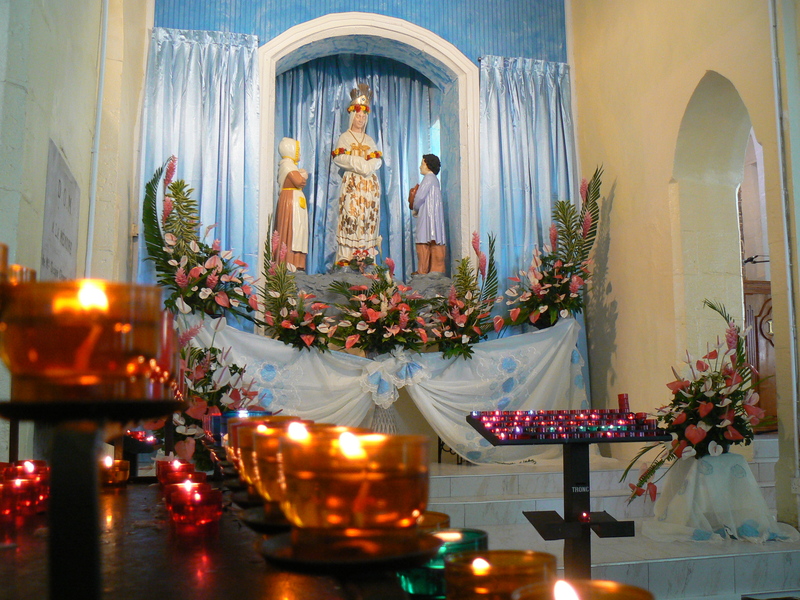 The devotion to Our Lady of La Salette in Dominica goes back to early February 1872, when Rev. Desiré Clément Ardois returned from France with a beautiful statue of Our Lady as she appeared to the two little shepherd children, Maximin and Mélanie on September 19, 1846 in La Salette in France. As he was the parish priest of Pointe Michel, he had a small side chapel added to the parish church where he exposed the statue to the veneration of the faithful. This chapel was blessed together with the statue on December 12,1889. 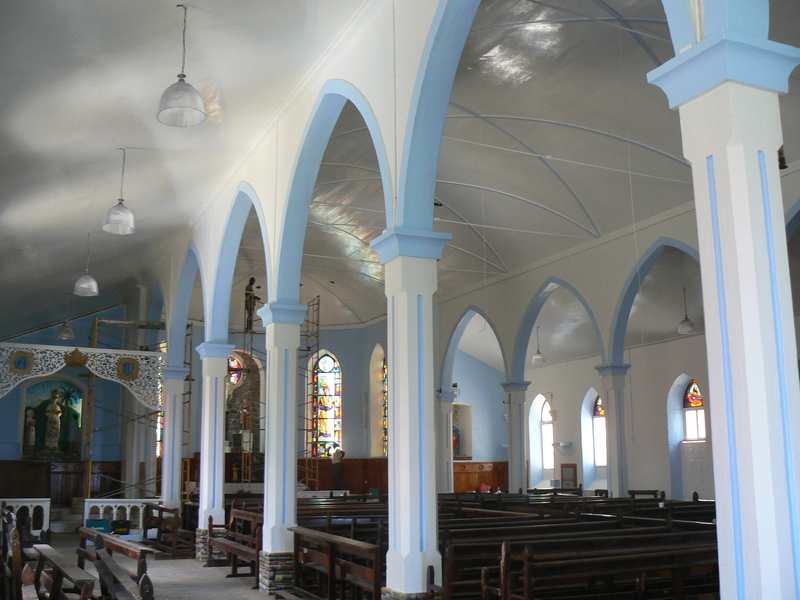 The Ecclesiastical Bulletin of Roseau reported that in 1873 and 1874 an immense number of faithful found their way to St. Luke’s from every quarter of Dominica and since then, year after year, the shrine has been visited by pious pilgrims on the 19th September. After the pilgrimage in 1875, Fr. Ardois was so exhausted that he suddenly collapsed and died a few days later. He was buried at the foot of the Altar of Our Lady of La Salette in the Pointe Michel church (see memorial plaque in wall). “Seldom has been witnesses in Dominica as wonderful a manifestation of faith as the feast of our Lady of La Salette, celebrated on Wednesday , the 19th of September ” 1923. Tuesday September 19, 1922: “The good people of Pointe Michel had vied with each other to make the village look gay and festive for the unique occasion. Arches with inscription in honour of Our Lady of La Salette were erected from one end of the village to the other, whilst flags, buntings, flowers and evergreens were conspicuous all along the road and in front of nearly every house…the interior of the church, especially the Sanctuary, looked gorgeous and glittering. The chapel of Our Lady surpassed all the rest in splendour”. One year (1923) the bishop recorded more than 6000 pilgrims. A temporary pavilion had to be erected to accommodate all the pilgrims. 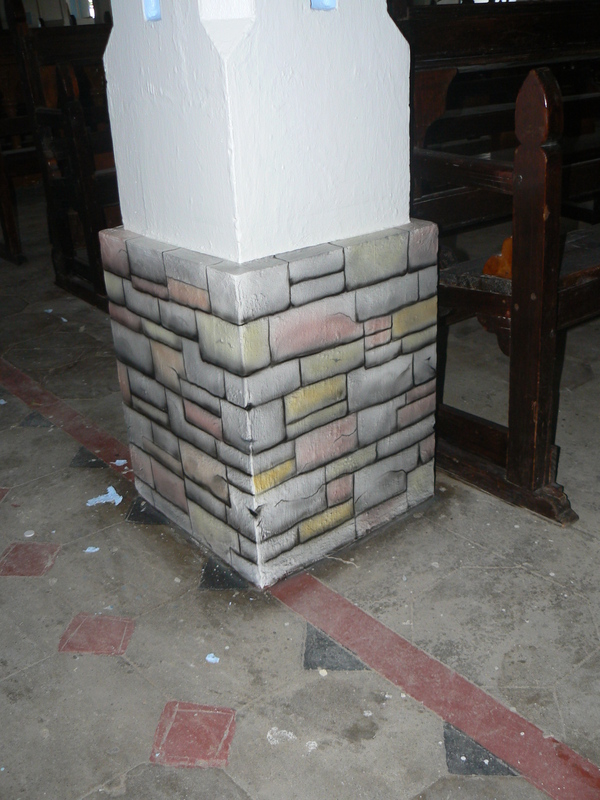 This entry was posted in Dominica's National Shrine, OLD CHURCHES and CHAPELS, Our Lady of La Salette, Our Lady of La Salette shrine, Pointe Michel church, RENOVATED CHURCHES on August 26, 2014 by Bernard Lauwyck.